SBP enables both in-house-based and cloud computing-based information and process management. An ontology language that is used to define ontologies for modeling of systems and processes. A universal business platform that interprets these ontologies and enables web-based information management and direct execution of modeled processes and their analysis. SBP includes Semanion Metamodeler (SM2) for ontologies creation and management, Tara Application Builder (TAB) for generation of web applications (directly executed in SBP) from ontologies, Semantion Registry and Repository for metadata and document management, Piva System Designer for system engineering and modeling, and Semantion SOA Virtual Machine (SOA-VM) for business process execution and analysis. Semantion metamodeling is based on Tara Ontology Language. Tara provides an ontological foundation for metamodeling of business, social, and technology related processes and systems. Semantion Metamodeler (SM2) is a tool used to define and manage ontologies in Tara. System and process data is used to make decisions that will keep improving overall business efficiency and provide support needed to execute and analyze business processes. The data is not uniformly managed and data and process changes in most cases require re-coding of applications providing data and process management. This is an expensive way of supporting business by IT. Semantion information management is based on Semantion metamodeling approach where Tara Ontology Language is first used to define an ontology and then the ontology is used to generate web application for information management or to model business processes and directly execute them in Semantion SOA Virtual Machine that is an SBP component. The best known challenge for the business process management today is how to directly execute business processes from their models. Semantion approach to business process modeling, execution and analysis is a pure "first model then execute" solution. Semantion Business Platform enables business activities involved in business processes to be modeled and executed as Lego-like software components that can be put together or taken apart when needed. This all can be done without any additional software updates. Besides Tara Ontology Language that enables modeling of processes and systems, SBP also uses Generic Process Semantics (GPS) that defines a universal process semantics that can be used to semantically interpret business and infrastructural processes. GPS includes three specifications developed by Semantion in 2005: SOA Information Model (SOA-IM), SOA Collaboration Semantics (SOA-CS) and Run-Time SOA. 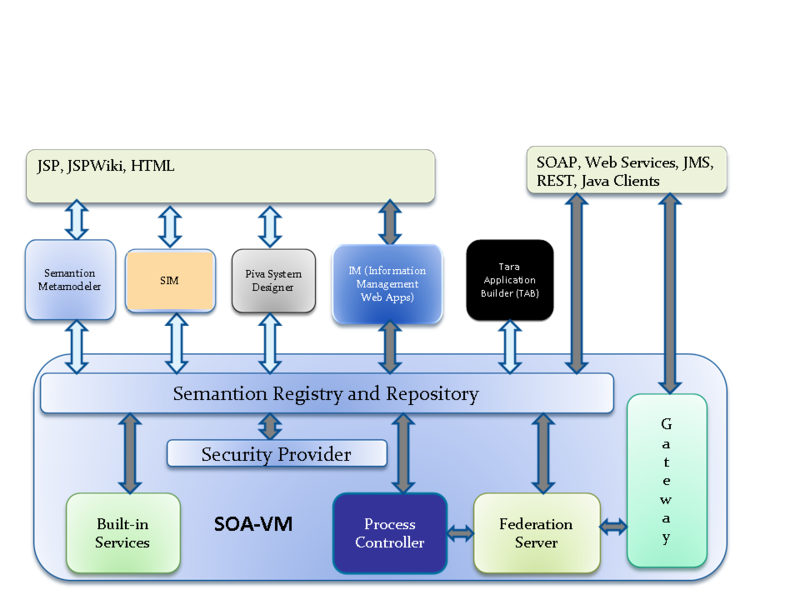 Process and system models are interpreted by Semantion SOA Virtual Machine (SOA-VM) with GPS embedded in its components. GPS is based on the Federated Enterprise Reference Architecture (FERA) that was defined as a result of a research on almost 140 business process use cases. SOA-VM is not a centralized process execution engine. It provides support for fully distributed execution of processes. On the other hand, a snapshot of a process is available at any point in time for detailed process analysis, or a full process recovery in a case of a system failure.